It’s winter. We just got a huge storm, which is totally fine with me. We are warm and toasty inside and it is beautiful to look at. I even got a little exercise shoveling this morning. Anyway, winter… In the winter I roast a lot of vegetables. I love roasted vegetables and they come in handy for tons of things as leftovers. Also vegetable that are good for roasting are pretty much the only thing at the farmer’s market in Maine in the winter. Pretty much every week I end up roasting a big batch, then using them throughout the week. I have also been making a big batch of lentils and using them as well. I cook the lentils in vegetable broth and the saltiness of the lentils pared with the sweet carmelization of the vegetables is something I crave on a regular basis. This recipe combines the two with some leftover pasta with amazing results. My husband stared at it before eating with a skeptical look, then went back for seconds saying “I just don’t get it, it is so good.” Gluten-free pasta works just perfectly here. I have use a brown rice-quinoa pasta that is a great texture for this. I have also use wheat pasta, so whatever your pleasure. If you don’t know how to roast vegetables it is pretty much the easiest thing you can do. Some people are a little more picky than I am on cooking times, but I choose vegetables that I like to cook about the same length of time and everything is wonderful. Simply chop vegetables into a uniform size, toss with olive oil and bake in a pre-heated 400 degree oven for 30-45 minutes, stirring every now and again, until everything is browning and carmelized. Done. The house is warm and you have a delicious and healthy treat for the week. The trick to this pasta is cooking everything until the pasta gets a little crispy which makes it ohh so yummy, and something you can’t make fresh. You need the cold leftover pasta to get the crispiness. Heat oil in a cast iron skillet over medium-high heat. 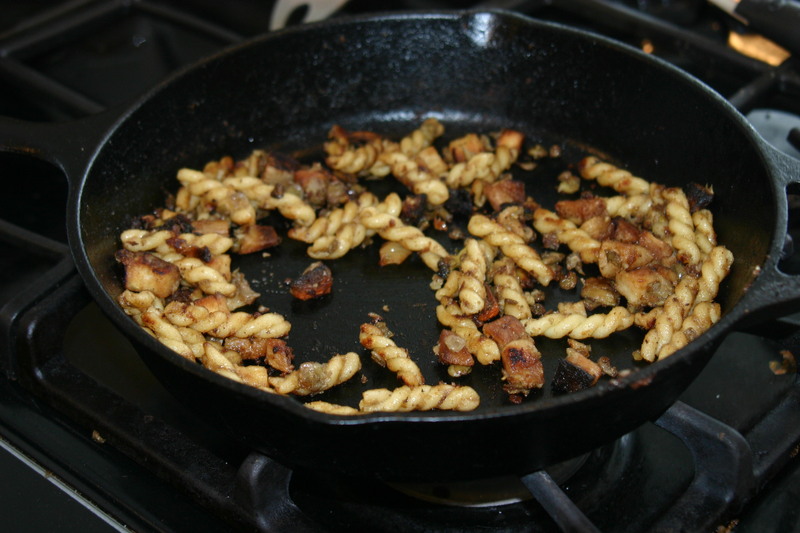 Add pasta, vegetables, and lentils cooking until parts of the pasta start to become crispy, 5-8 minutes. Taste and add more salt and olive oil as desired. Reblogged this on Look – See – Shoot.